Ever in need of an easy cocktail? 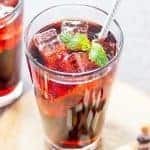 This 2 ingredient Kalimotxo Cocktail is a mixture of red wine and cola. A traditional Spanish cocktail! My summer tapas series continues with this 2-ingredient cocktail called the Kalimotxo. I started the tapas series this past week with my Pan Con Tomate and a post on what Tapas is and now continue with a cocktail to wet your whistle. If you have never heard of a Kalimotxo, it’s ok. I will tell you all about it and how I came to know of it. Another Spanish legend, seems like all I have are Spanish legends, tells of servers mixing red wine that is not up to par with leftover cola. Like a Cuba Libre made with wine instead of rum. The drink servers in the tents are called “txosna” in Basque festivals and they mix the sour/subpar wine and cola and name it after two friends, Kalimero and Motxo, now Kalimotxo. Don’t worry about trying to pronounce it with the t and the x separately because the “tx” makes a “ch” sound as in chicken. Sound it out like this: Cal-E-Mo-Cho. I learned of the Kalimotxo while watching The Real Housewives of New Jersey. A few of the ladies from Italy, or Italian descent, would drink red wine and Coke at lunch. After a few episodes, I just knew I had to try it. I thought it a little strange but totally intrigued!! Who wouldn’t be?!? I love red wine, especially Pinot Noir, and the thought of a new cocktail made with it got me a little excited. Now I have tried weird combination before. Remember the Laverne and Shirley show? They drank milk and Pepsi together. Sounds strange but I tried it. It tasted good going down but not so good coming back up if you get my drift. The Kalimotxo tastes great going down and it stays there! You can also think of this Kalimotxo cocktail as a sangria of sorts. 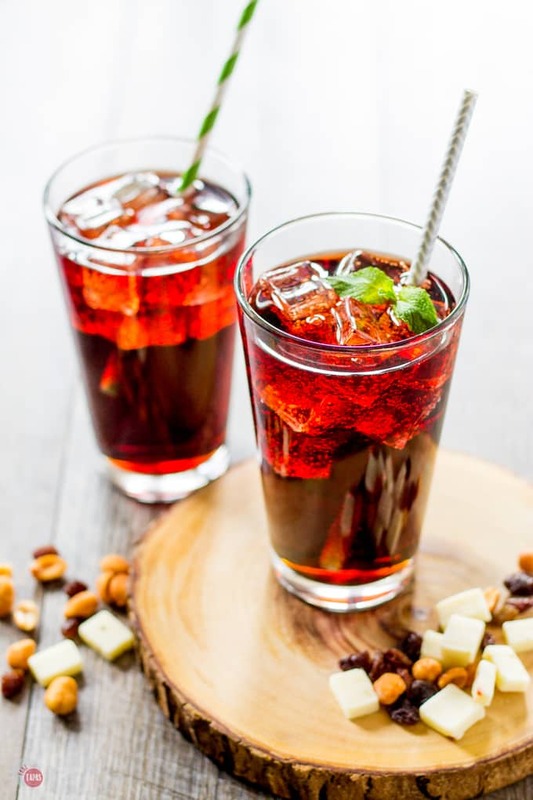 Sangria is wine mixed with juice and brandy and this mixing of the red wine with cola is very similar to it. The cola has the caramel flavors and the sweetness as the mixers do which is perfect to balance out the sour or tart wine. Kalimotxo is typically served in short glass tumblers like these. Plenty of ice is added, then the red wine and cola. In other areas, the Kalimotxo is served in taller glasses. A hint of mint tops off the combination! 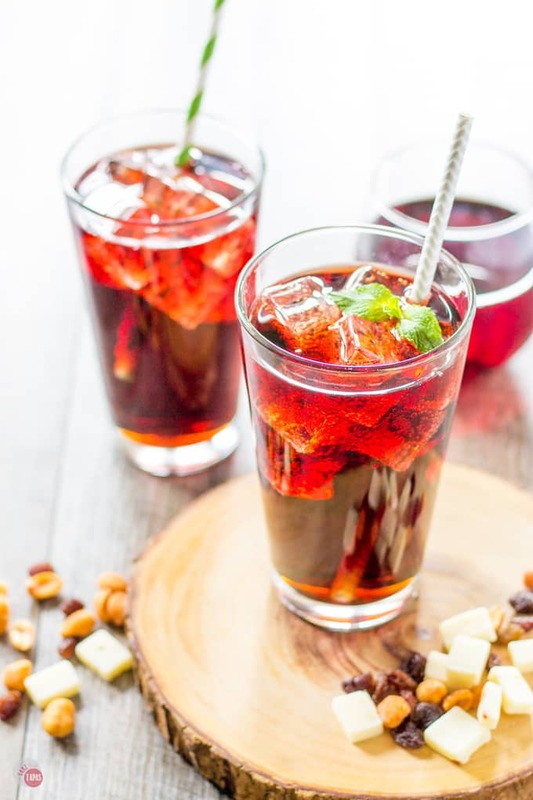 If you are not fond of cola, a sweet sparkling water will do the trick. I love the caramel flavors of the cola with the rich, cherry flavors of the wine. I always have half-empty cans of soda lying around thanks to my kids, and thanks to my hubby I have an endless supply of red wine. The two never go to waste in my house thanks to this easy recipe! If you have some rosé or red wine lying around whip up a Watermelon Rose Frosé from The Gastronom Blog, this sangria from Platter Talk, or this Slow Cooker Sangria from The Foodie Affair for the winter. Whether you think I am totally off my rocker or not, you must try the Kalimotxo cocktail. You will love it with all the other tapas. 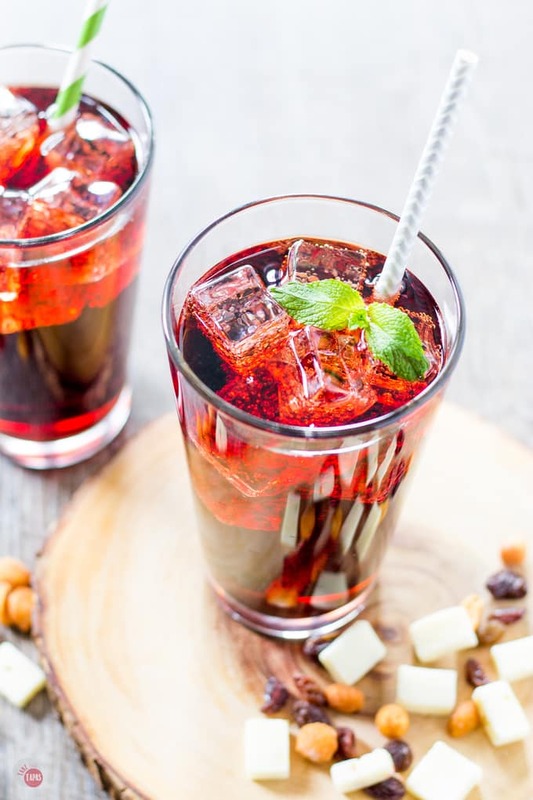 A combination of red wine and cola make this 2 ingredient cocktail a must! 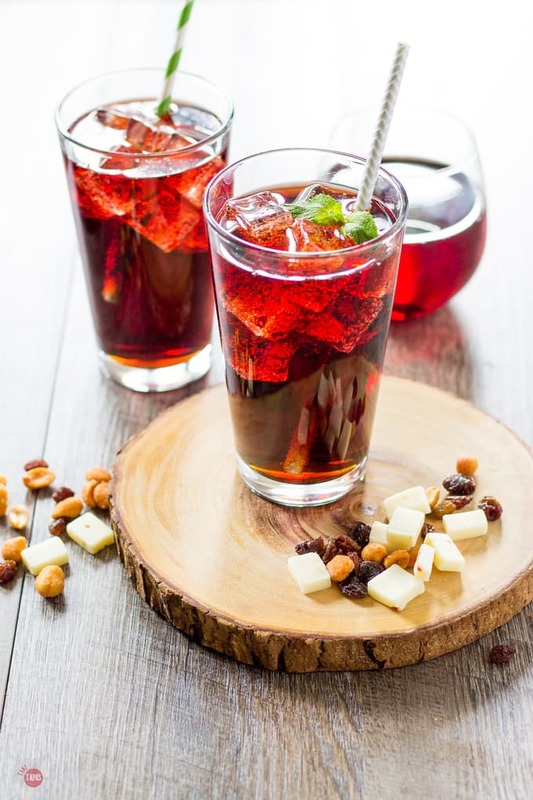 A traditional Kalimotxo or simple sangria of sorts that is definitely worth a try! Pour red wine and cola mixture over ice. « Staying Hydrated Instead of Being a Raisin! This sounds really good. I like the mint as a garnish!